Our Dreadnoughts are powerful and wonderful guitars to play. Great quality tone from bass to sparkle and in everything in between. This one being mahogany delivers strong mids and a warm, articulate sound with high-end cosmetics. The LR Baggs StagePro Element is a side-mounted preamp/EQ that offers battery access and a full chromatic tuner that is hidden beneath the control panel to maintain a clean, classy look. The three band EQ with phase inversion and Garrett Null notch filter controls deliver warm, pristine sound even under the most challenging conditions. Artist Series is now “The Award Winning Artist Series” – winning competitions and receiving rave reviews in the States, Europe and around the world. It’s a truly designed line of guitars that stands tall and sounds sweet in the solid top guitar market. Hand selected solid tops; forward shifted scalloped bracing, awesome tone and player experienceâ€¦. The term “solid top” of course refers to the soundboard of an acoustic guitar being made of solid wood, rather than being laminated. However, just because the top is solid, it does not necessarily mean the sound automatically benefits from this feature. The tone of the instrument only improves significantly when the whole guitar is built correctly to really release the energy a solid soundboard can generate. Artist Series is built to do exactly this. Each model is designed to get the best out if its components, and for them to work together to produce a tone and player experience, rarely found in affordable instruments. These components include our FST2M bracing system, bi-level bridge, real bone nut and great quality tone woods. FSTM is a forward shifted X brace design. Both the X braces and asymmetric tone bars are scalloped. Moving the system forward allows for a larger soundboard, which is optimized with a solid maple bridge plate for both strength and energy. The sound is warm, open and powerful, and both the treble and bass registers are clearly present and balanced in relation to each other. These guitars feel right and are exciting to play and responsive. Dig in and they shout right back at you, treat them gently and they whisper and respond instantly to the lightest strum or pick. 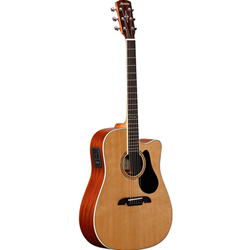 The solid â€˜A’ grade Sitka spruce and cedar tops are hand selected from quarter-sawn wood. This ensures consistent quality, and its no secret better guitars are made from better wood. Our tops not only look great but they are stiff and strong and finely grained. New Artist Series guitars look stunning and come in a huge variety of shapes, colors and wood choices from standard OM and Dreadnought models to more specialist instruments such as Baritone and Parlor. Each shape is also available in a left-handed version.